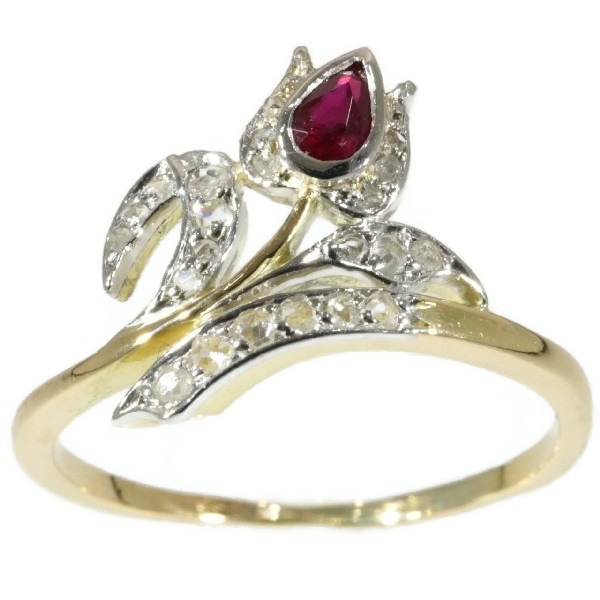 Elegant antique Victorian ring tulip motif with rose cut diamonds and ruby: Description by Adin Antique Jewelry. Representing a tulip, this ring consists of a beautiful pear shaped ruby surrounded by a petal with 3 rose cut diamonds on each side. A stem leaf with 7 diamonds on the left side of the bloom and one with 3 diamonds on the right are lifted up by a downwards base with 6 diamonds. Although the diamonds are encrusted in platinum, notice the 18K yellow gold foundation beneath the setting extending into the peduncle and the ring itself. Style: something between the Late-Victorian and Belle Epoque style - Victorian decorative arts refers to the style of decorative arts during the Victorian era. The Victorian era is known for its eclectic revival and interpretation of historic styles and the introduction of cross-cultural influences from the middle east and Asia in furniture, fittings, and Interior decoration. Victorian design is widely viewed as having indulged in a regrettable excess of ornament. And the Belle Époque style (Belle Époque is French for "Beautiful Era") was a period in European social history that began during the late 19th century and lasted until World War I. Occurring during the time of the French Third Republic and the German Empire, the "Belle Époque" was named in retrospect, when it began to be considered a "golden age" the major powers of Europe, new technologies improved lives and the commercial arts adapted Renaissance and eighteenth-century styles to modern forms. In the newly rich United States, emerging from the Panic of 1873, the comparable epoch was dubbed the Gilded Age. In the United Kingdom, this epoch overlaps the end of what is called the Victorian Era there and the period named the Edwardian Era. Material: Two tones of precious metal, the main part being 18K yellow gold and the white parts are either white gold or platinum. Diamonds: 22 rose cut diamonds. We do not have the weight of the diamonds which is normal in our trade when it comes to rose cuts.